Russian-born violinist Lydia Mordkovitch passed away earlier in the week. 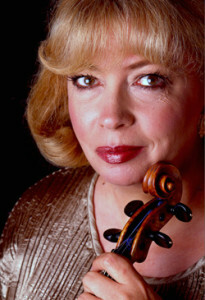 She was a student of David Oistrakh and served as his assistant in the late 1960s. In this interview she talks about her Russian musical roots and the influence of Oistrakh’s teaching. Mordkovitch emigrated to the United Kingdom in 1980. In 1995 she joined the faculty of the Royal Academy of Music. Her extensive discography on the Chandos label includes music of English composers (violin concertos of Arnold Bax, William Alwyn and George Dyson) and Max Bruch’s seldom heard Second and Third Violin Concertos. Listening to a sample of Lydia Mordkovitch’s recordings, I was struck by the soulfulness and honesty of her musicianship. While many contemporary violinists seem to sound alike, her tone was distinctive. The Loure from J.S. Bach’s Third Partita (the second movement in the final clip below) is an example of Mordkovitch’s singing approach to sound and wide array of tonal colors. To hear Lydia Mordkovitch at the peak of her interpretative powers is like being thrown back half a century when the likes of David Oistrakh, Isaac Stern and Yehudi Menuhin held sway…She has never believed in half measures and here every note is played to its maximum expressive potential, whether it is a raging violin fortissimo or a gentle viola pizzicato.